When trying to decide which neighborhood you want to stay in during your trip to Philadelphia, what you plan to do on your vacation will help determine which is best for you. While each neighborhood has its own amenities, some areas are much more convenient for exploring various parts of the city. Leisure travelers will enjoy exploring the historical landmarks of Old City or the hip shops and restaurants of Fishtown and Northern Liberties while business travelers will likely appreciate the easy commute time from Center City or University City. Whichever neighborhood to choose, there's sure to be plenty of great accommodations available, including Airbnb listings. The official visitor site for Greater Philadelphia is an excellent resource for finding descriptions, reservations, and discounts, including the Philly Overnight Hotel Package, which includes hotel accommodations for two nights, free parking and other perks. If you're looking for a more quieter place to say, you can check the Bed & Breakfast Connection of Philadelphia for unique accommodations that are currently available instead. Old City is the most convenient place to stay if you’re visiting Philadelphia to visit historic attractions around Independence National Historical Park. This is where you’ll find the Liberty Bell and Independence Hall as well as the first hospital in the United States. The area is also a mecca of shopping, dining, entertainment, and nightlife, so you won’t need a car in Old City if you decided to stay here. However, with the exception of hostels and a few mid-range chains, this is an expensive area, and rooms tend to fill quickly, especially during spring and summer breaks. Society Hill is just south of Old City and features a number of historic homes, shops, and streets. It offers close proximity to the main historic attractions in a somewhat quieter, more residential setting. There are several bed-and-breakfasts nearby that provide a bit more character than Old City's establishments at a fraction of the cost. Center City is convenient no matter where in Philadelphia you plan to explore or want to see. It's compact and easily accessible by walking, public transportation, and tour buses. In addition, staying in the middle of Center City will put you closer to the museums of the Parkway and the rest of downtown Philadelphia, including one of the city's biggest tourist attractions, Rittenhouse Square. Washington Square West is convenient, centrally located, and popular for LGBT visitors due to its proximity to the "Gayborhood." Rooms in the area fill up far in advance of the annual Equality Forum in May and many other gay events including Philadelphia Pride. Because Washington Square West is right next to Center City, you can expect to find the same prices on bed-and-breakfasts and a few cheap hotels. The Parkway is beautiful during the daytime when all the museums are open and people are wandering down the sidewalk between them. However, the area can be a bit desolate at night and the only accommodations are chain hotels and local Airbnbs. However, it's relatively close to Center City, so it isn't a bad option if you find a better deal at one of the Parkway hotels rather than the ones in Center City. If you're visiting Philadelphia for a business trip, chances are you'll be put up at a hotel in Center City or University City, if not near the airport a few miles south of Philadelphia. However, there are some advantages to staying in each part of the city. Center City is home to the majority of the skyscrapers that make up Philadelphia's skyline, so if you need to go into your office on a business trip, you'll likely find it here. As an added bonus, once the workday is over, you'll be in a good spot for exploring and enjoying the city after hours. There's plenty of bars, clubs, and restaurants you can discover nearby—many of which offer lunch deals for your business lunch as well. 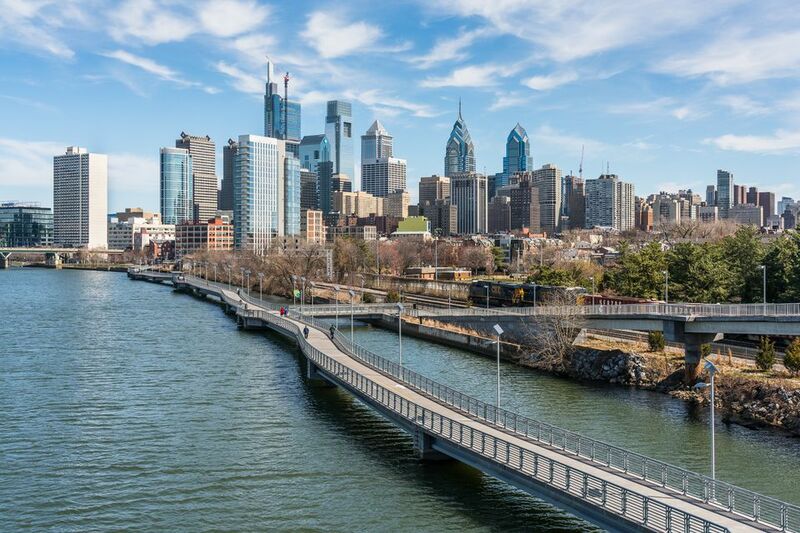 University City is just across the Schuylkill River and a little less expensive than Center City in terms of hotels and apartment rentals. Home to the University of Pennsylvania and Drexel University, it's a good place for students visiting with their families or parents. It's also home to many affordable bars, restaurants, and attractions worth exploring after you're done with the workday. Airport hotels are another great option if you're looking to save on your accommodation and don't need to go into the middle of Philadelphia during your trip. Although the airport is located a few miles south of the city, it's also close to the stadium and events center, which makes it a great place to stay if you're in town for a sporting event or concert. The Philadelphia Airport Marriott also has a direct connection to the terminal, so you can easily catch your early-morning flight.